An anniversary of sorts. A year since I had unexpected surgery which resulted in many side-effects, and which has put my life into a different pattern for the last year. The pattern has been generally unpleasant, not to say miserable. So for some reason I decided that I must mark this anniversary by trying to push myself into doing something I really did not want to do. And then I would feel better. Ha! Pot-holing would be my absolute first choice of things I don't want to do. I am not prepared to go that far, or that deep. I am not prepared, ever, to go down a pothole, to squeeze through a dark rocky tunnel, to possibly be trapped by rising water. Travelling in a hot-air balloon is number two, or at least travelling in that dangling basket with no sensible way of getting out of it apart from thumping down and probably tipping over. Being dependent on wind and flame doesn't seem the best idea to me. So I went for the swimming option. I am bad at swimming. I flounder about and forget to breathe. I don't like the chlorined water, but swimming in open water is a whole separate category of nightmare. Thank goodness I have not passed a vestige of this dislike to my sons, one of whom swims in any river, sea, lake or large puddle he can find, the other who holds all sorts of open-water diving qualifications. Not only is there a dislike of swimming, but there's a reticence about appearing in a swim suit. I would quite like a Victorian bathing machine to tow me down to the water so that I can then submerge myself very, very discreetly. Several weeks earlier, when it seemed like a good idea, I booked a swimming course here. But nearer the time it no longer felt like a good idea, and I had extremely cold feet, not just about facing several acute dislikes head-on, but also driving at least twice as far as I have driven in the last year. If I hadn't paid in advance I would probably have cancelled. But I went shopping and realised that there are swim suits with what is called 'tummy control'. I really need whole body control after surgery, but having some area under control is a positive step. I drove to North Wales on Easter Sunday, accompanied and over-taken by large numbers of motorcyclists on huge, glossy expensive machines. I envied them, encased in leather, sitting there being dashing. They were just having a great day out, going to see some waterfalls or the sea. None of this nonsense about proving themselves, testing themselves. I arrived. I booked in. I unpacked and I looked out of my window at the monkey puzzle tree outside and thought how much I would prefer to be climbing it, rather than dunking myself in a swimming pool. Then we started, five of us in a very warm pool. Well, it had to be warm because we were in it for up to four hours at a time. And we could do more, if we wanted. I was much the oldest, but I could do what the youngsters did. Steve is a wonderful teacher. He explained a lot about bouyancy and natural floating levels and made us swim with balletic grace. Well, he tried. No thrashing about allowed. Be kind to the water, let it help you, it wants to help you. Don't disturb the water, don't create even a ripple. Just relax. Enjoy it. I came home again. I felt proud of myself for having faced things I find difficult. I would do it again and try to improve, to be graceful, to breathe sometimes, to relax and enjoy it. It's good to go on learning at 75. Well done! Like you swimming has never been my metier probably since I fell in a boating lake aged 5 and almost drowned. The very thought of jumping in makes me cringe and as for getting my face wet well...! Such a shame especially when some years ago I went on holiday with a friend to Turkey and we went on a boat trip round the islands set in turquoise sea and a couple of times the boat dropped anchor and most of the others enjoyed jumping into the warm clear water and I was left climbing down the ladder and only able to swim near the boat where I could grab hold if need be! It's never too late to learn things though and I do admire your spirit. Marigold: thank you. I so nearly chickened out. I can really recommend these adult only classes for very small groups.I can't say I enjoyed it, but I will make myself continue, especially as I now have three tummy control swim suits! good for you...you'll have to teach The Pirate!! They do water exercise classes at my gym, though I've not gone to any. The water is supposed to be a good medium for injured or older joints. I used to love to swim, but I was lucky to have lesson at a young age. I really should go swim at the gym one of these days. Courage is an underrated virtue, that leads to unexpected satisfactions. The water wants to help you. I like that a lot. My cousin send me a holiday photo once, with her in a bathing suit beside a pool. I decided then and there that if she could be that comfortable being seen in a photo, then I would try to aspire to the same sangfroid. After all, I'm about the same shape, and her two decades older. Oh wonderful! And good for you! It is, in my world, very important to push the boundaries of one's courage, to spend much time out of one's comfort zone etc. And I'm with you on the pot-holing, which makes me think we should do it! gz: he's got to want to do it! Leslee: sometimes the Welsh is a bit unecessary, as with road signs that say 'Wrexham' for the foreigners and 'Wrecsam' for the locals. Zhoen: the swim suit is a big part of the problem (literally, in my case). Julia: I'll take a rain-check on the potholing, thank you. I've been thinking about swimming again. I've never been good at it, and a few years ago made a diligent effort to get better. I improved, but never got to the stage I was aiming for. Partly that was because the instructors didn't recognise what I now think was the main problem — I worked that out for myself, eventually, but that was just before I headed to South America, and I never picked up where I'd left off. You might have inspired me to get started again. Jenny and P.Pete: how wonderful to inspire. 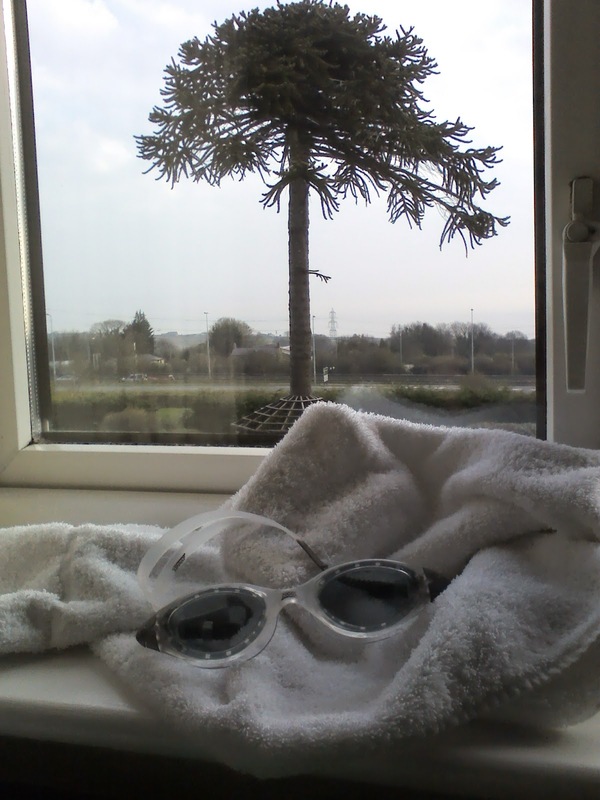 Actually I think it's warm water and really good goggles that do the trick! Tummy control swimsuits sound excellent, RR. But, some of us - well me - have thighs which have turned stringy, pubic hair that has migrated down the legs, and a generally scrawny superstructure that one might have doubts about offering to the public gaze. Is there any hope for swimming attire that is not Victorian nor Islamic, but just ....discrete? Somewhat concealing but still celebrating? Gosh, I think we must have been separated at birth. I too would hate to pothole or go up in a balloon and haven't swum for years because I would feel embarrassed in a swim suit. Good for you! Sorry you've had a miserable year. I hope the next ones are much better. I'm concerned that the pattern has been "generally unpleasant" or miserable,RR. Although I don't know you, I can read you, admire you and regret your difficulties. As I do.